Many thanks to Joy, who sent this in from a July 1960 issue of Katy Keene. I admit to more than a sneaking suspicion that I am a Bertha! I mean, the polka dots alone are a dead giveaway! Oh, well, if everyone were always tasteful how boring the world would be. I can’t help but wonder about Leon De Lap of Wichita Kansas. Was Leon a little boy, unashamed of his love of fashion? A grown man who contributed dress designs to a little girl’s comic book? A little girl with an unusual name? I have never saw Katy Keene till I came here. I like her. I love dots!!! I don’t see you as a Bertha at all. Your stuff may be bright but it works together. I have to agree with juliar, your dresses are bright and they do work together. I liked the green dress, and the blue dress. Visit my blog! Do you think tube tops will ever make a comeback? I found this blog by Google searching Leon Delap. 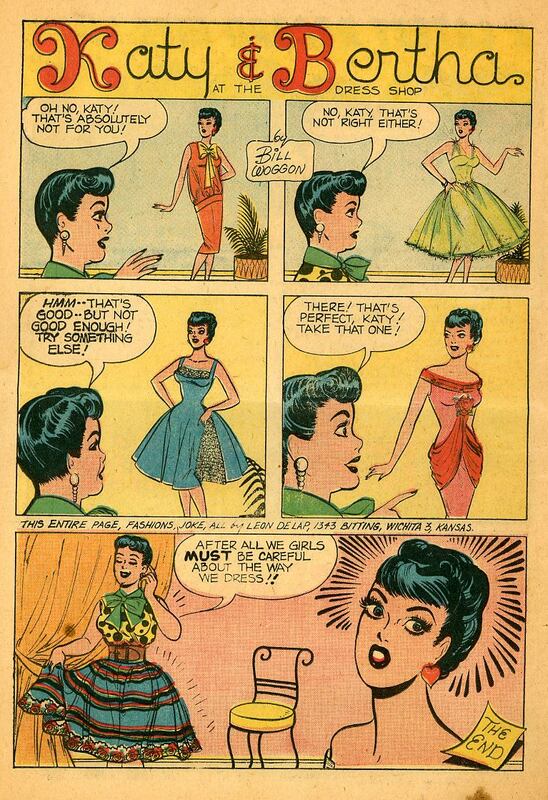 My dad and I were also curious about who he was, and if he became notable after sending in so many fashions.I found two mentions of him in my comics- one from Katy Keene Holiday Fun #7 (1960), and one from Katy Keene Charm #1 (1958). Hope this helps clear up some of the mystery behind this guy. My name is John from Wichita, Kansas. I knew Leon so let me tell you a little bit about him. I went to school with him through the 50’s and we graduated from high school in June of 1960. He and I were pretty good friends for a time and who knows how long he had been sending in those designs. He was not ashamed of being who he was, a quiet and relatively effeminate guy who endured a lot of cruel teasing. I have no idea if he was gay. A few of us offered some half-hearted defense against the jocks. I read on another site that he later moved to Canada and became a relatively successful writer and editor. He died in 1987 at the age of 45.